According to the Centers for Disease Control and Prevention, an estimated one in 68 children has been identified with an autism spectrum disorder (ASD). Although a growing number of parents face similar circumstances, many still feel isolated and alone. 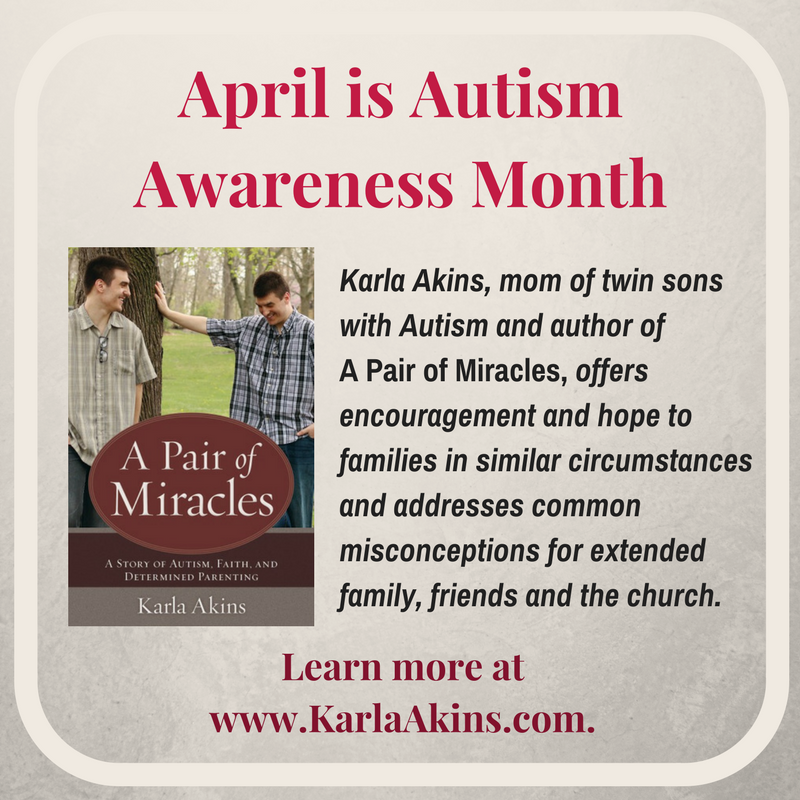 In A Pair of Miracles: A Story of Autism, Faith, and Determined Parenting (Kregel Publications), author Karla Akins, the mother of twin sons with autism, offers encouragement and reassurance. 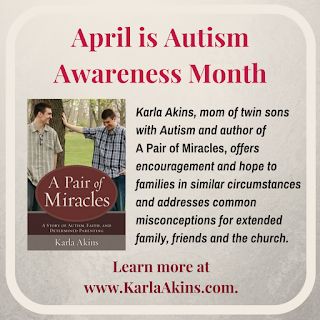 Learn more about A Pair of Miracles at www.KarlaAkins.com. Q: Tell us a little bit about your family. How many children do you have, and how did your family come together? I have one step-daughter, two biological sons and two adopted sons. We had struggled with infertility and came to foster parenting because of our desire to have another child. Prior to adopting the twins, we had two foster children who were adopted by other families. It was after a foster baby we had from birth to almost 11 months old and was given to an adoptive family (the agency we were with would not allow foster parents who already had children to adopt) that God gave us the opportunity to be foster parents to the twins. Our social worker (who knew we wanted to adopt) called, and we had about 30 minutes to decide whether or not to say yes. I knew I’d never be able to let them go, so I sensed this decision was an adoptive decision, not just a foster-parenting decision. The twins were preemies, and Isaiah came home from the Neonatal Intensive Care Unit first. A month later Isaac came home, and the adventure began! 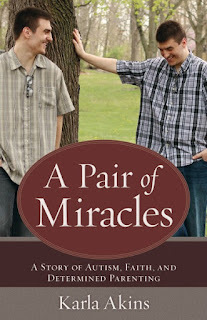 Q: Who will benefit from reading your new book, A Pair of Miracles: A Story of Autism, Faith, and Determined Parenting? I hope families and caregivers will be encouraged by reading about our journey and might gain a few ideas on how to work with their child. I also hope they will feel like they’re not alone in the struggle. I know I like to read books that validate what I’m feeling. It’s always good to know you’re not the only one in the trenches, fighting the good fight of day-to-day survival with autism. I’ve included a generous section on how to work with your child. These include ideas that worked for us but also some evidence-based interventions proven to work for a lot of children with autism. Since I’m also a special-education teacher, I hope the book will help educators understand what families deal with. I’ve sat on both sides of the IEP table. I know the stress of advocating for what’s in the best interest of my child, but I also know how it feels to be an educator. Educators and parents need to work as a team, and the book gives great tips on how to do so. Q: You include sections with scripture to meditate on. What verses have meant the most to you throughout the years? Psalm 139 is my favorite scripture passage because it talks so much about how God knew us before we were born and how He is always with us. There are many things that happen I don’t understand, but this verse keeps me praising instead of complaining. It also gives me permission, in a way, to wrestle with God about the hard stuff that goes on in my life. It also helps me realize I can trust God, even when things don’t make sense. He’s in control. Q: What misconceptions do most people have about autism? What would you most like your readers to understand about autism? I wish more people would understand autism is different in every person. It’s a spectrum disorder, which means there’s a wide spectrum people fall on. I have friends with children who have a severe form. Their children are grown now and still can’t toilet themselves. I have friends with children who have children who are considered high-functioning because they have high IQs, but the child can’t shower independently without guidance. It’s a neurological disorder, not a behavioral or psychological problem, and it manifests in a myriad of ways. When you’ve seen one child with autism, you’ve seen one child with autism. It will look different in another child. Q: For parents who are walking the road of raising children with autism, what advice do you offer for becoming the best advocates for them when it comes to medical care? Trust your God-given instincts, and don’t second-guess yourself. God gave those children to you, and He will equip you to do what is right if you seek Him for answers and wisdom. Put everything in writing when you have a concern that isn’t being answered. Do your research to make sure any treatments you desire for your child are based on evidence and not trends. Q: What are some of the other areas you discuss in the book for living life with autistic family members? I really want parents to take their children out in public and de-sensitize their kids with autism to uncomfortable situations. Yes, it’s inconvenient, but you do your children no favors by hiding them away at home. Society needs to see them, and the child with autism needs to be exposed to the sights and sounds of the world so they can learn to cope. I talk about how difficult mealtimes were. They were a nightmare when the twins were small. Food was thrown everywhere, and a lot of screaming went on. Looking back, now I can see the screaming was from anxiety, but I didn’t realize it then. We learned the twins ate better if they ate in the dining room while we ate in the kitchen. We all had to learn not to take it personally. It was just what it was. At that time, our kitchen had a cut out in the wall to the dining room. We’d put two vinyl table cloths on the floor under their high chairs and let them go at it. It was the only way we could eat and have a conversation. Every meal ended up with them painting themselves head to toe with food. They couldn’t eat solids because they had poor motor control, so I pureed everything for years. I also discuss the need for a network of support because of how stressful it is to raise a child with autism. I learned I couldn’t care for the boys without help, and I needed to admit it. Q: How were your other children impacted by their brothers’ autism? What recommendations do you have for parents to make sure their other children don’t feel overlooked? If I had my kids to raise all over again, I’d have been more deliberate in scheduling one-on-one time with each of my children. I think we were too busy. I try not to second-guess myself, but it’s hard not to. What parents absolutely must not do is depend on their other children as caregivers. Yes, definitely, they can help out because that’s what families do. However, every child needs to feel they are a child and sibling, not a parent. Q: Can you share some of the basics teachers at church and ministry volunteers should know when working with a child who is autistic or has disabilities? What tools are offered in your book? My book has a great appendix that answers questions about working with people with autism. I give a lot of great tips on how to respond to different behaviors and how to motivate kids with autism. Remember all children are unique, no matter what their ability or diagnosis. Also remember a diagnosis is not who they are. They are children and people first. They just happen to have a label. Churches can embrace families living with disabilities by providing one-on-one aides in the child’s classes so the parent can attend their own classes. This also allows the child with disabilities to attend church with children their own age too. I offer training to the teachers and those working in the children’s department. I love giving training seminars. People can contact me through my website. 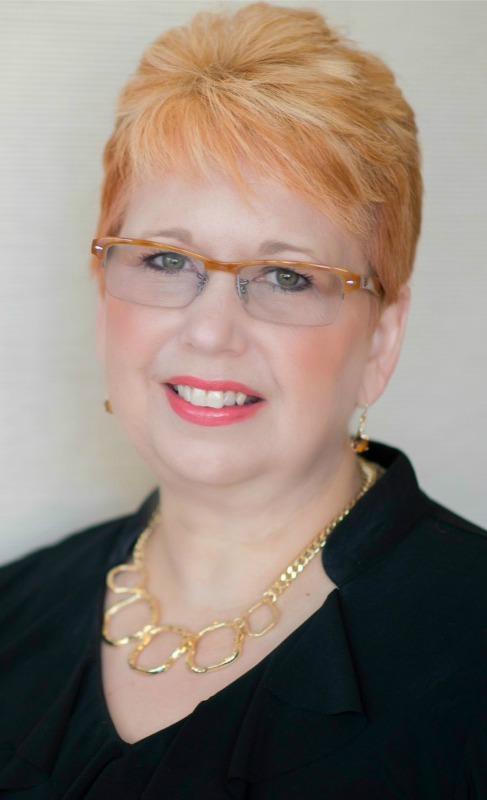 I also do one-on-one online consultations as well. Folks can sign up on my scheduling page. Thank you for featuring this on your blog, Laura. 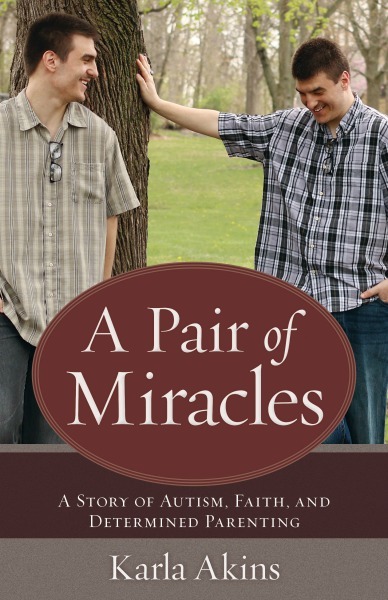 A wonderful interview and testimony of God's love and faith that the twins have. I have this book in my TBR pile. Thankful my little rural home town decorates the square for Austism Awareness Month.